I liked their recepcionist Cassia, so friendly and helpfull. I like of the localization and the cleaning. I stayed in a studio, so we didn't have breakfast included. But there are a spar very close and the prices are awesome. The studio was equipped with pans, glasses, plates and all utensils than I need. beds were comfortable. cleaning staff did well everyday. desk clerks were very helpful and kind. wifi was superb. Pool wasn't crowded but it was only the end of May. Very good value gor the money . 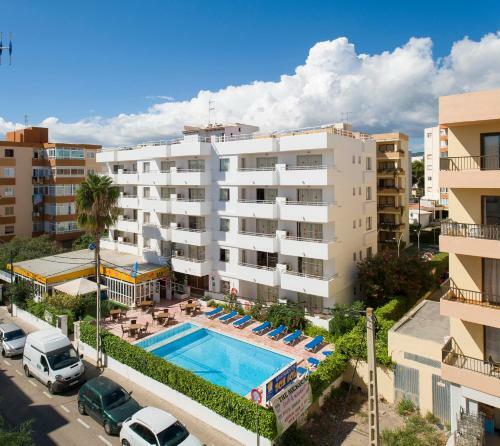 Big apartment great view close to the beach .nice helpful staff . Good staff at reception and especially Anthony. Good location in Ibiza. 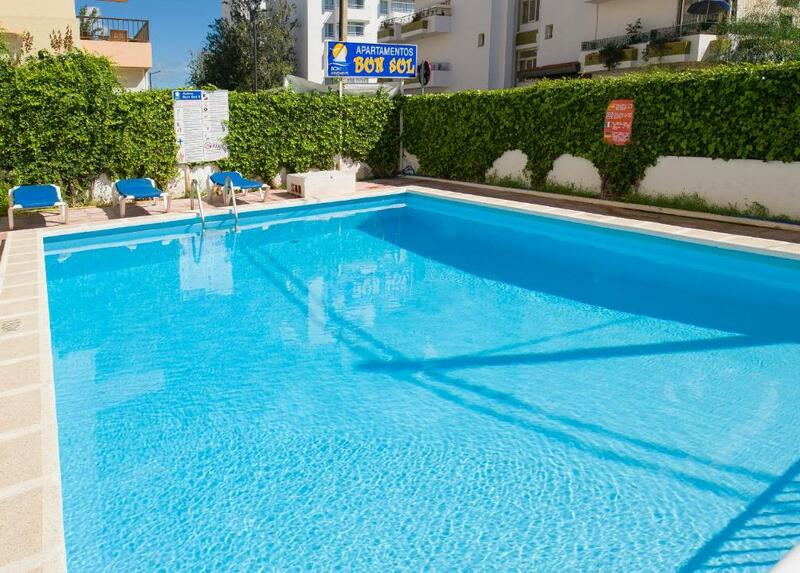 More than one swimming pool with loungers. Great accommodation for people on a budget , bit untidy from the outside, very outdated in room but clean . Couldn’t fault it for what we payed . You have access to there sister hotel 200 yards down the rd which is a four star . Apartment was very spacious with big balcony and clean. Fresh towels and cleaning everyday. I missed a flight and needed a room late at night. This is the last place I would ever return to. It is in an unpleasant area, half the lights in the building did not work and are on a timer. My room key didn't work 90% of the time. I spent uneasy night, I remained fully clothed and alert. breakfast for which I paid £8 had to be taken in a strange cafe full of men, across the road which I would not have gone to but for water. I am a well travelled older woman travelling alone and this was the worst experience of my life. I picked this hotel for the location, I had researched it so I knew my level of expectations. Our room was 310 for 3 adults. We didn't use any of the facilities so cannot comment, the only thing we used in the apartment was the fridge and kettle. Having a 24hr reception is great. Apartamentos Green Line Bon Sol - AB Group This rating is a reflection of how the property compares to the industry standard when it comes to price, facilities and services available. It's based on a self-evaluation by the property. Use this rating to help choose your stay! 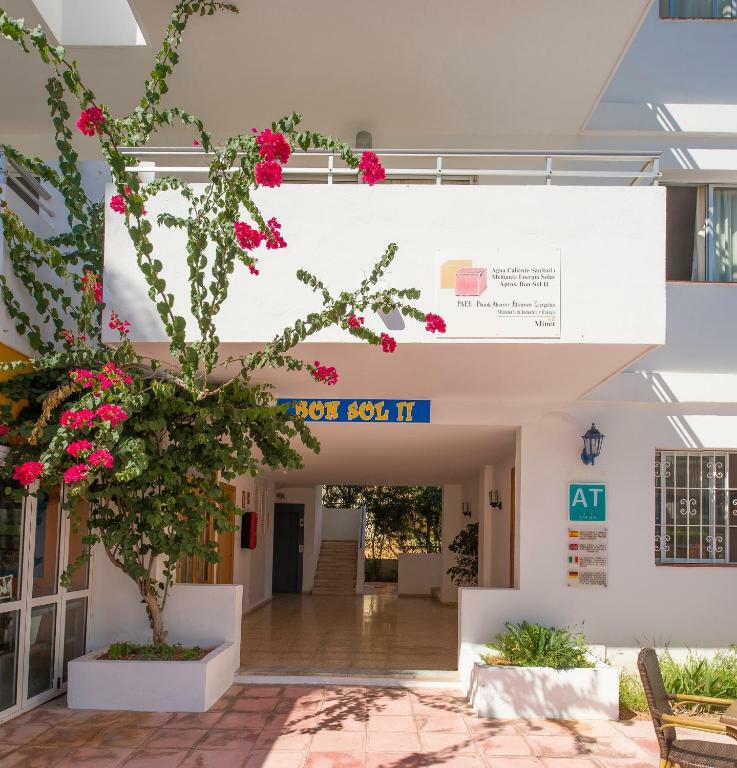 Apartamentos Green Line Bon Sol offers simple accommodations 500 feet from Playa d’En Bossa Beach, 1.9 mi from Ibiza Town. 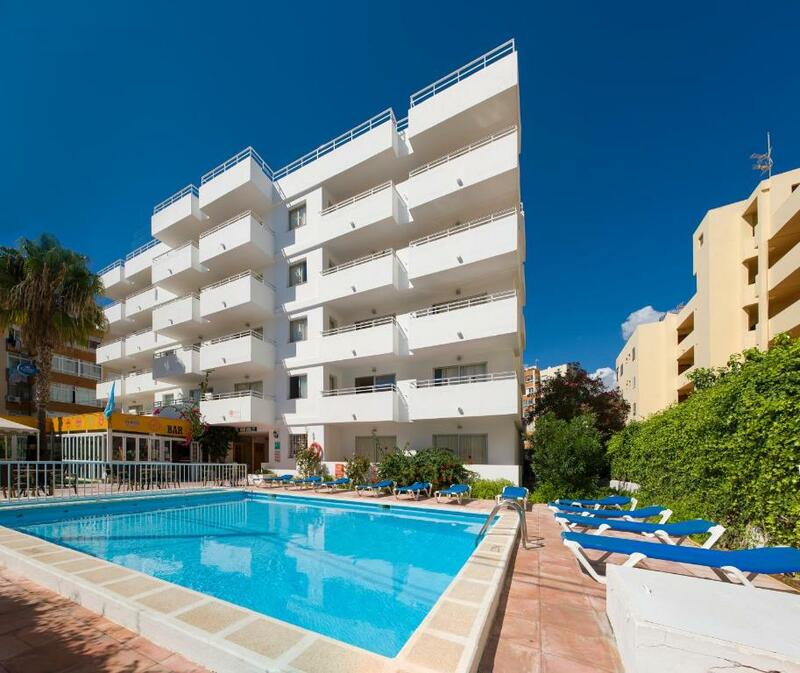 It features an outdoor swimming pool, and apartments and studios with large balconies. All accommodations at Apartamentos Green Line Bon Sol is bright and decorated with wooden furniture. Each studio and apartment has a kitchenette with a fridge, microwave and cooking rings, and a TV in the seating area. Live entertainment is offered at the 3 Monkeys Bar. Guests also have access to amenities at the neighboring Bon Sol Squash, where there is a restaurant, café, and squash and tennis courts. The complex is a 10-minute walk from Space and Bora-Bora Nightclubs. A supermarket can be found within 82 feet, and Ibiza Airport is less than 2.5 mi away. This is a seasonal complex, open from April to October. 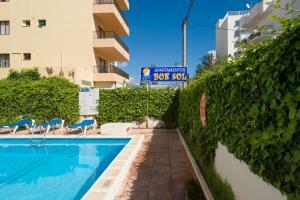 When would you like to stay at Apartamentos Green Line Bon Sol - AB Group? 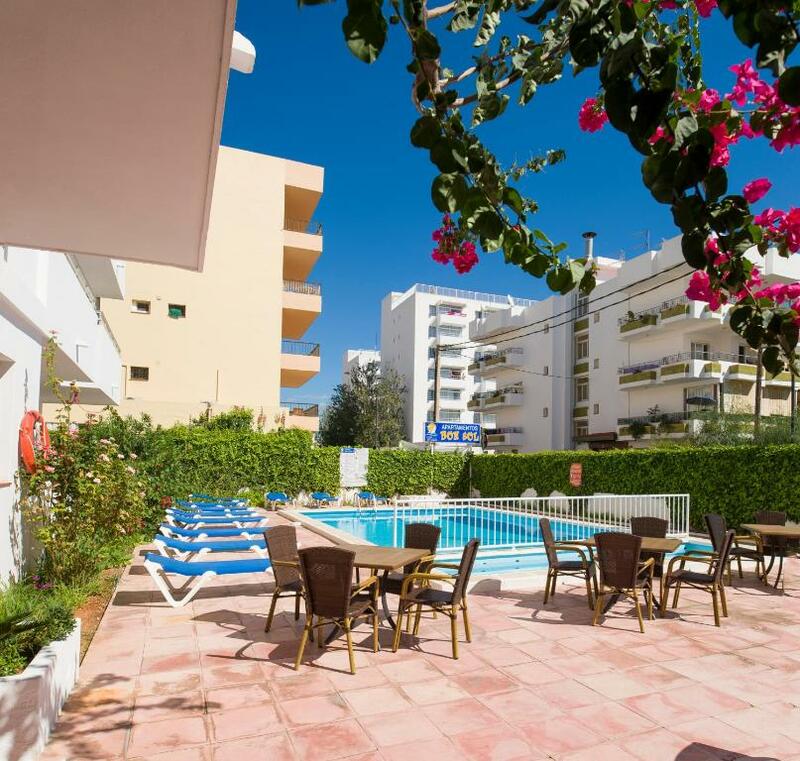 This bright, one-bedroom apartment is decorated with wood furniture and has a balcony and access to an outdoor pool. There is a kitchenette with a fridge, microwave and stove and a TV in the lounge area. This bright studio is decorated with wood furniture and has a balcony and access to an outdoor pool. There is a kitchenette with a fridge, microwave and stove and a TV and sofa bed in the lounge area. 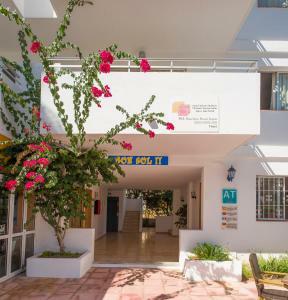 Our apartments are only 150 metres from playa den Bossa. 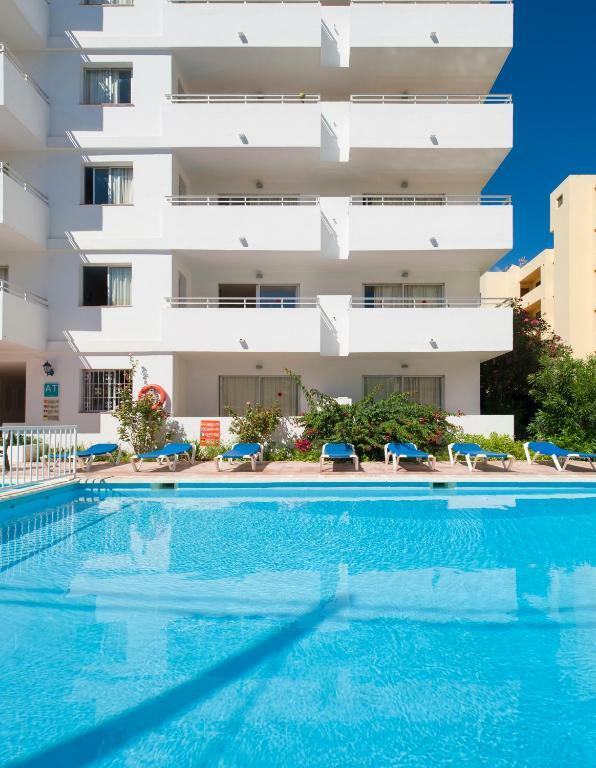 They all have a big balcony and guests can enjoy of the 3 swimming pools in our complex. House Rules Apartamentos Green Line Bon Sol - AB Group takes special requests – add in the next step! Apartamentos Green Line Bon Sol - AB Group accepts these cards and reserves the right to temporarily hold an amount prior to arrival. Check in was at hotel down road, apartment was again in different complex again. Horrible, dingy terrace, with difficult door to close. Kitchen had been 'cleaned' with a greasy cloth. Bed uncomfortable, shower seal broken, so lots of water on floor. I was not made aware that the tap water is not potable by the hotel staff, only by a friendly local. Not very clean rooms but quite cozy. Lift works only occasionally. No proper kitchen utensils, no dishwash provided. Booking showed king size bed and the one given was small. Alternate was a sofa bed with which the supporting leg was broken. There was a massive hole in one of the mattresses, no WiFi, we weren’t in the apartment complex we’d booked (no pool! ), the fridge was broken and sitting on the stairs outside the apartment. Staff wouldn’t move us anywhere else as it was full apparently. Not a pleasant experience. When arriving to the hotel i wasnt greeted by anyone, there was construction work going on in their food area, no water in the pool and wasnt the 5 days i was their. When trying to check in i was greeted by a door sign that said the check in was at a different hotel, this took us about 20 mins to figure out and find.when i booked im sure the room lay out was different, and i asked for a double and got 2 singles. These beds was not nice to lie on and hurt your back. The TV didnt work, the remote batteries was held in by a peice of paper stuck to the back. the bin in the kitchen area was t a bin it was a mop bucket with a bin bag init. In the bathroom the shower must of been the worst as the shower head was broke and the water was spraying in about 10 different directions that soaked the shower curtin to the extent it soaked through every time we got a shower and went all over the floor. the sink in the bathroom every time you would use it it would block up and take about 2/3 hours to empty. I only liked the location the hotel was in. Poor WIFI conections. I missed the ashtray and remotes for AC and TV. The property I lived in was at 2 street away of the recitation. The sofa bed part in the lounge had broken bed slats so we had to put the mattress on top of the sofa bed to make it more comfortable. It was quite a noisy place in terms of music being played when your trying to rest but being that it was out of season it wasn't too bad (i'd recommend ear plugs). My apartment was located in anoher building in the back far from the swimming pool, also by the night the corridor that lead to the other building was very dark and no light was available so I had to use the torch of my phone to guide myself. The door locker wasn't working fine, it was a card lock and I had to "master bate" the locker with the card until it get open. I was very close to the beach and I was alone but the apartment could host 4 people comfortably. Also they had all the facilities on the kitchen to cook or store food in the fridge. We had 2 rooms booked. When we arrived in one of the rooms the key card wasn't working properly, the safe key that we paid a deposite wasn't working and the balcony door wasn't opening. We went back to the reception and they said they will send someone. The repairs where like this: the deposit door still didn't work so we had to use just one to keep both belongings, the entrance door sometimes worked sometimes didn't work (one morning we had to go 2 times to ask receptionist to make a new key - BTW he didn't bother to come help us) and the balcony door opened but the security look didn't work anymore so the person who stayed in that room had to trust that no one will enter the room. But as I said we could get over those small mistakes even if we paid everything in advance for the trip. We just wanted to have a good time. The worst part came at the check-out. A day before the check-out we went to the reception and said that we would like to do a late check-out because our flight was at 6pm and we wanted to sleep late. Alejandro the receptionist told us that we could stay if we pay extra and showed us 3 payment plans. He also told us that we can pay than or the next day! We agreed upon paying the next day and continued the day. In the morning the new receptionist "Sarah" and the mades entered in our rooms 3 times waking us up every time and showing us the clock and telling us that we have to leave the rooms. The sole purpose we wanted to pay the fee was to be able to sleep. When we got at the reception and asked why this happened "Sarah & Alejandro" where both there and Alejandro started arguing with us! When I felt that his attitude was rude I asked him if he can call his manager because I wanted to talk with him. He told me he wont give it to me and told me to search for it on the website. When I asked for the website he told me he wont give it to me! 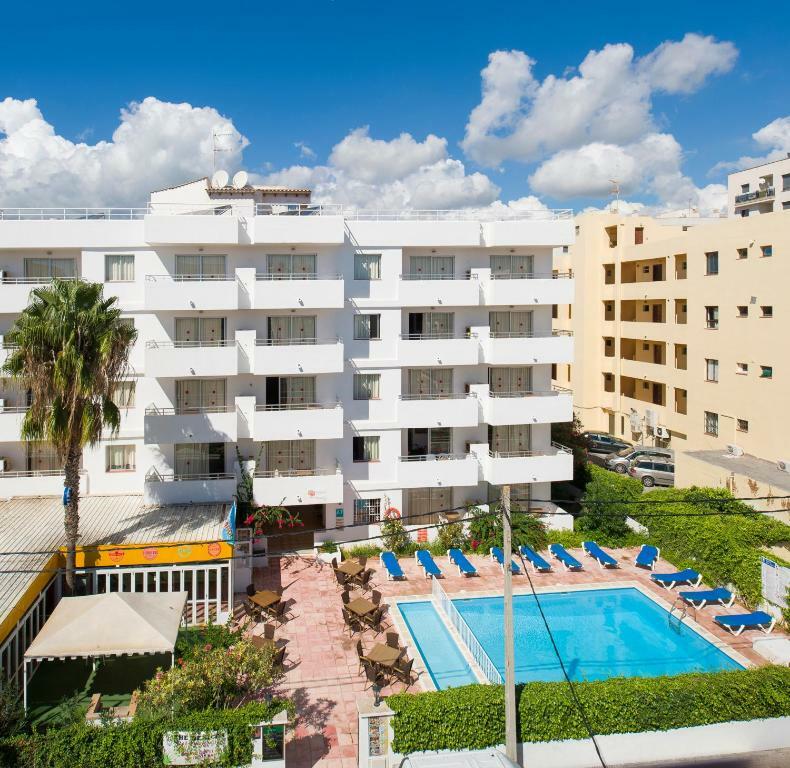 The location of the apartments is rely good exactly in playa den bossa! 15 min walk from Ushuaia, Nassau Beach. 5 min walk from the actual beach. Really nice they have a lot of supermarkets nearby where you can buy groceries for the room.